The match will see some of the biggest names in the game go head-to-head, in a bid to raise vital money for the rehabilitation of Sean Cox. The Meath native was the victim of an unprovoked attack outside Anfield last year ahead of Liverpool’s UEFA Champions League tie against AS Roma. Republic of Ireland legend Jason McAteer and Liverpool FC Ambassador Ian Rush were on hand to launch the match and were joined by Sean’s wife Martina Cox, Sean's son Jack and Stephen Felle, a trustee of the Sean Cox Rehabilitation Trust. Republic of Ireland manager Mick McCarthy will take charge of some familiar names in green, while Sir Kenny Dalglish will manage of the Liverpool legends. McAteer, Phil Babb, John Aldridge, and Ireland record goalscorer Robbie Keane will play for both teams in the match, having all worn the green and red with distinction. The likes of Kevin Kilbane, Kenny Cunningham, Lee Carsley, Ian Harte, Stephen Hunt, and Kevin Doyle will feature of Ireland with more names still to be confirmed. Speaking at the launch, Jason McAteer said he was looking forward to playing in Aviva Stadium for the first time, especially for such a fantastic cause. 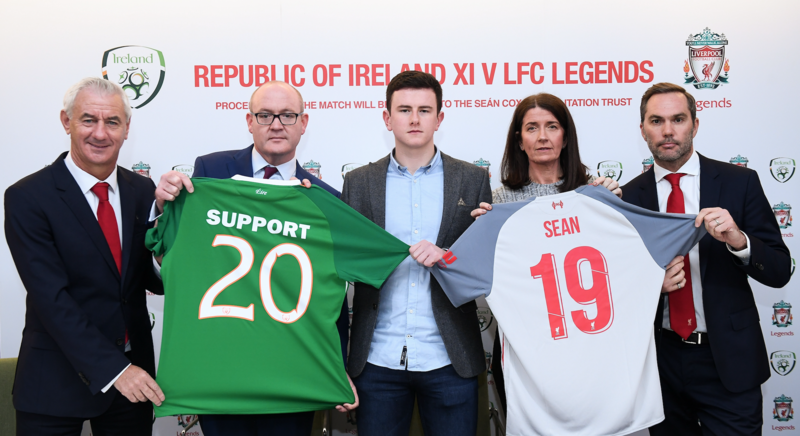 Republic of Ireland and Liverpool FC legends were at Aviva Stadium on Monday to officially launch the April 12 match between the two sides, in aid of the Sean Cox Rehabilitation Trust.